Erik and Pavla Nygaard's Thor-Bred Stables LLC, the breeder of Battle of Midway, announced that the first foal sired by Battle of Midway, a filly out of Giant's Causeway mare La Boheme, was born at 2 a.m. on Feb. 7 at Chesapake Farm in Lexington, Ky.
La Boheme and her filly are owned by Thor-Bred Stables LLC. Battle of Midway had a highly anticipated but short season at stud following his 2017 Breeders' Dirt Cup Mile win, when it was discovered at WinStar Farm that he was subfertile and only a small handful of mares were found in foal to him. He returned back to training in July 2018. 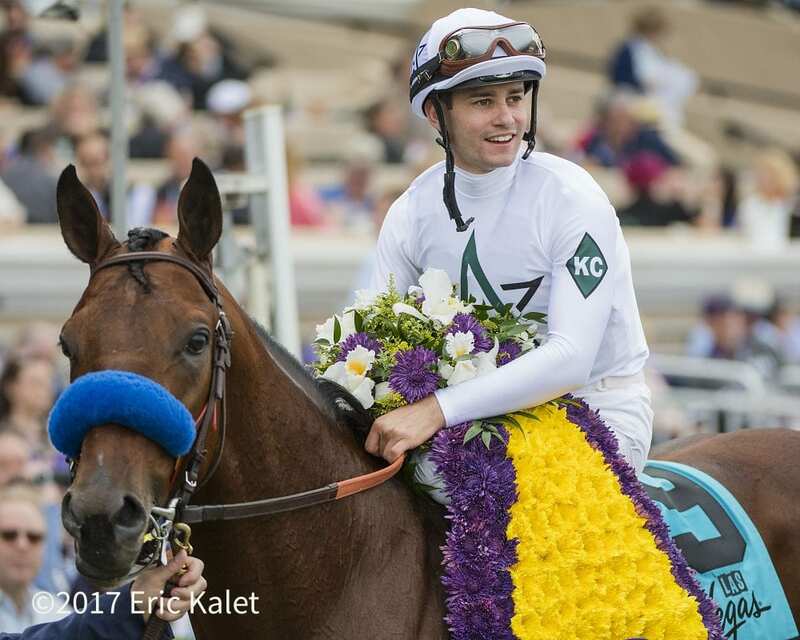 He has since run six times, all in stakes company, winning three times, most recently on Feb. 2 in the Grade 2 San Pasqual Stakes where he outdueled heavily favored McKinzie to the wire. Battle of Midway's owners, Don Alberto Stable and WinStar Farm LLC, are seriously considering the Dubai World Cup as a possible next start. This may set up an unusual scenario of a Dubai World Cup competitor already having at least one foal on the ground to cheer for her sire. Thor-Bred Stables has established itself as a breeder focusing on quality from a small broodmare band, comprised largely of broodmares retired from its racing program, such as G1 Oak Leaf Stakes winner Rigoletta, who is the dam of Battle of Midway. Thor-Bred Stables' other notable breeding program graduates include G1 winner Klimt, G3 winner Ocean Knight, G2-placed Nero and G3-placed Lemoona. This entry was posted in Bloodstock and tagged battle of midway, Chesapeake Farm, Cory Mathes, Erik and Pavla Nygaard, first foals, La Boheme, Thor-Bred Stables by Edited Press Release. Bookmark the permalink.